Heyy ya just got back from Camp Tecumseh, had a smashing time there but i'll elaborate on my next entry. There's something more important to post about! Who else you say? Jay Chou is here to stay! This MV is super weird, like, my gosh it's so random! A bit of posh car/slick girl show in the beginning, then the korean-style hiphop dancing, with Jay jiving all the cool moves, suddenly they all turn into Ju-on's Mommy crawling and dancing, after that the real stuffs comes in like learning chinese medicine (which is supposed to be the main gist of the song title and lyric), and OMG some more hiphop dancing, now featuring 2 kids doing headspin omg.. then a cute little boy dressed in a chinese vampire costume (僵尸) came bouncing out, playing with Jay and doing the vampire moves omg.. AND ALL THIS WHILE A NEW MOTOROLA PHONE WAS ZOOMING IN AND OUT OF THE WHOLE MV! lol.. soo rojak.. but it's so cool! Jay rox! I think that in the chinese community, there are 2 groups of people: those who hate and detest jay chou's songs and those who simply go gaga about his unique blend of music. I am left-handed. It never bothers me being a leftie at all. You know, every morning, you wake up and go to bathroom to relief yourself, finding that the flush is on the right side. "Several findings suggest that lefthandedness may be associated with reduced longevity. For instance, Porac and Coren reported that 13 per cent of 20-year-olds are lefthanded but only 5 per cent of those in their fifties and virtually nobody of 80 or above. We believe that this absence of left-handers from the oldest age groups reflects higher biological and environmental risk." Taken from this source. 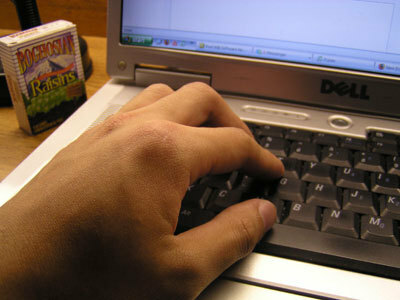 (3) left-handers may suffer more accidents in a world designed for righthanders! Hmm.. I'm not sure about reason no 1.. Ma, was I in anyway born abnormal? reason no. 2 might explain why i cannot stand weather coldness and also my nasal problems in the morning.. But reason no 3? LOL.. guess i can blame you all righthanders out there! Nah, just joking. I'm fine with doing certain things with my right hand, like playing bowling, writing calligraphy, etc etc. I'm sure those small things won't cause accidents gua..
so what did i really do on saturday? oh yeah, i had lunch with my care group leader Andrew Lee.. belanja him lunch at dining hall with my meal swipes which i can never finish.. i explained gel electrophoresis and its applications to him, and he shared his expereince as a teaching assistant. Afterwards i followed him to the church around 2pm. There was a special welcoming dinner that day so we went early to help out. But i was neither musically-talented nor drama-orientated, so being not much of a use there i spent the afternoon at the church's library.. found a book written in 1987, but it gave me insights on communication with people and God. I dozed off an hour later lol.. I woke up just in time for the service. After that more people came for the free dinner. I met 3 japanese girls by the names of Yasuko (やすこ), Takako (たかこ), and Mikako (みかこ). Okay, normally japanese names are written in kanji form, but i haven't learned it yet, so i'll just make do with hiragana =P anyway i had fun talking to them, applying those stuffs that i learned in the japanese class. They were surprised, and no kidding i was so engaged in talking to them that my friend said i was flirting. Hey, i wasn't flirting okay! I'm merely using what i have learned! anyway i met some malaysians there too, and spent time talking with them. Dinner ended at 11pm (with performances such as dances, drama and games). After that i went to Wal-Mart to do midnight shopping for Malaysian Students' Association callout/bbq on sunday. It wasn't my job initially, it was my roommate's. Okay, i was cool at first even when he ditched his duties for a game of soccer, but I can't help but being frustrated later on when he called me after the game saying that another committee member has already bought the stuffs. Imagine me pushing a trolley filled to the brim with 20 bottles of soda, bbq sauce, corns, frozen packets of fries, charcoal, plastic paper and cups and a big watermelon almost waiting in the line to pay up. AND THAT IS NOT ALL. THEN HE CALLED BACK TO SAY THEY WERE JOKING. THEY WERE FREAKING JOKING AT THE LAST MINUTE WHILE I WAS ABOUT TO PUT ALL THE STUFFS I TOOK BACK TO THE SHELVES. I was so pissed. I don't know what to say but i was very tired and disappointed. My senior who accompanied me to WalMart was surprised to see my sudden change of face. I become cold and mute whenever i'm angry, but that time i forced myself to smile and talk to him about how cheap the watermelons are. Anyway we drove back and put the stuffs with the girls who generously helped us prepare the fries and corn. I reached back to my room at 3am. and HE WAS PLAYING SOCCER GAME ON HIS DESKTOP. I really had nothing to say. Sunday morning came. I had a brunch appointment with my research professor at 11am. The day before i reminded the committee people that i might be late for the callout because of that. So i was sitting and chatting with my professor, her husband, and 5 other lab members while eating potatoes and sausage casserole with blueberry muffins (both are awesome by the way) and I received missed calls. I instinctively knew who it was from but i couldn't return the calls then. Must be asking me to do some chores again. I was having a good time for a change so don't you spoil it. I arrived back in my room half an hour before the callout. Guess what he was doing? FREAKING SOCCER GAMES AGAIN. Like he has nothing urgent to prepare when the president has given orders to set up the bbq pit. Took the food from the girls, and went to the venue almost half an hour late. I was so afraid that the freshmen might arrive on time and went back because they didn't see anyone there. Luckily, a few seniors were there already to keep the people around. Wah.. now my mind is back to mountainloads of homework! Still i have to say, happy labors' day!